It was an early dash through Smithfield, with cheeky Bummarees calling out at me as I ignored the anti-cycling signs (what signs?) and whizzed through the tail-end of the morning's meat market. Down to St Pauls, swooped round and along then over London Bridge to meet my fellow eco-warrior Vicki (Director of the Kingsnorth No New Coal film, and fellow Wise Woman) before hopping on the train down to Strood in Kent. So off we headed to support the protest against the proposed new-build coal station at Kingsnorth. 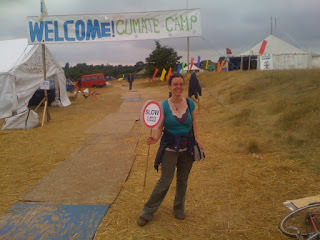 Into the camp, eventually, and it's glorious - a haven of peace and commonality of purpose, with hundreds of tents smattered around clustered in geographical areas (Londonium I am told has the best facilities, naturally. They have sofas in their feeding tent), composting loos to rival those at CAT, the odd freestanding turbine and PV panels. Bunting billows in the early morning breeze as the sun starts to warm the early morning haze and the clouds begin to disappear, opening up to a warm blue-skied summer day. I am speaking on Concentrating Solar Power in the main space - the one with electricity, so I am informed. I am offered a bike to power my presentation, but sadly it seems to only give power to either the laptop or the projector, not both at the same time. How great that would have been to have had it generating clean energy to give my talk on the ultimate clean energy solution, courtesy of a fast pedlar. By 10.30 the camp has woken up, and tent A fills. There are workshops running throughout the day and all week, which is a marvellous way to tap into some excellent speakers on all matters climate change related. It's a good turnout, and later as I survey the site I reckon there are in around 1500 folk there and some kids. One pretty eight year old tells me he will make me a paper fan for anything(!). So we seal the deal for half a choccie bar, but only once he has been assured on the contents - that it is indeed vegan and is made of raw chocolate and agave syrup. He seems very pleased. I am equally pleased with my fan. 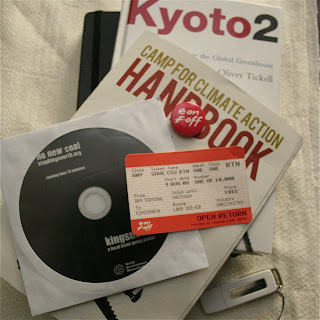 I bump into chums old and new, catch up with more radical WW's - and Oliver Tickell, author of Kyoto 2: How to Manage the Global Greenhouse, which delights me greatly. I've been itching to read it, as my gut instinct had been telling me that it will be an important one. 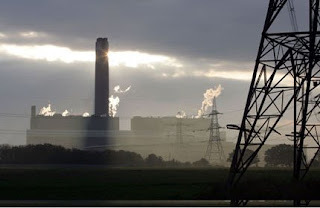 In a nutshell, Tickell is advocating upstream control of greenhouse gases at point of production, not of emission (ie nail the oil companies, not the consumer). Lunch at Londonium is delicious before scooting off to the site media tent for a bit of an interview, then off to hear a few workshops: Shaun Chamberlain on TEQ's (who argues from the other end of the spectrum - downstream control: carbon rationing of the consumer), David Flemming (the originator of TEQ's) on Anarchy (whom, upon arrival at the site, was reputedly chased by eager journos wanting to know if he was an elderly Tory MP. What anarchy he could have had there!). It's hard to leave. The evening light is long, the banter fun (Meyer Hillman is stomping around furiously, indignant about some comment made by George Monbiot), fresh garlic wafts across from Wales (no sofas here; they have hay-bales from Machynlleth), and I had promised to pop in to commune with my fellow Scottish countrymen and women (bet they do great porridge first thing). But no time, we have to go (having hitched a lift back - thank you Oliver, much appreciated). 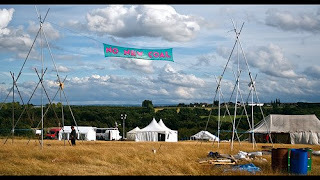 We head of into the sunset as more people are pitching up in preparation for the day of mass action and march to Kingsnorth Coal Station on Saturday. I wish I could be there - the preparations sound fantastic. The only blot spied on the landscape is the batallion of 22 police trucks filled to the gills moving in with yet more troops. What kind of world do we live in when the state deems it neccessary to lavish £7 million on policing such a well-organised, peaceful but vitally important (and legal) protest? Just wanted to second Polly's favourable write up. Despite the almost comically over the top police presence, once on site it is a wonderfully inspiring and relaxed place to be with yummy food and thought-provoking conversation on all sides. If you have any spare time between now and Sunday and can get yourself down to Kent, I would highly recommend it.